Hotel Colón has the best seat in the house. Literally, it’s right across from the Barcelona Cathedral and is the only hotel that shares the square directly in front of the Gothic masterpiece. A classic joint, the hotel was built in 1951 and has hosted luminaries and dignitaries from Sofia Loren and Jane Fonda to Francis Ford Coppola and Jean Paul Sartre. Not only that, it was actually the home of renowned painter Joan Miró for more than a decade. Inside, guests will find an opulent lobby and refined rooms that harken back to a time of upscale hospitality. Rooms are broken into two categories of classic and design. The classics come with carpet while design rooms have ceramic floors that are made to look like hardwood. Soft green and/or blue headboards are standard as are Nespresso machines and bottled water. Make sure to ask for a room with a Cathedral view. You can’t get closer than this! Bathrooms also vary by room category but there are rain showers, shaving mirrors, marble sinks, towel heaters, and bidets (or some variation depending on price). Products are by Omnisens Paris. An opulent lobby is encased in red marble and decadent design. A gold chandelier hangs from the ceiling, an antique grandfather clock is upright against the wall, and there deep red couches for lazy travelers. The rooftop pool is a tiny rectangular shaped spot with views of the Cathedral. In the winter they crank up the heat and it turns into the perfect hot tub. White loungers are splayed throughout. Also on the roof is the hotel’s sauna and steam rooms, in addition to two massage cabins and an ice fountain for cooling off. A variety of treatments are available for guests. 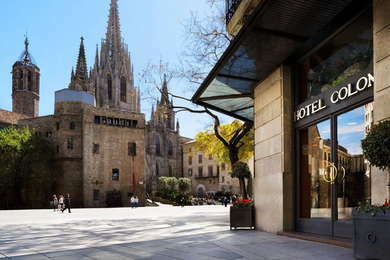 The main dining outlet is Restaurant Catedral, which serves Catalan cuisine for lunch and dinner and offers up giant window views of the square and Cathedral. A separate breakfast room is open from 7 to 11 am and if you book directly, the buffet is included. There’s a lobby bar here, but the real destination is up on the roof. White high-top tables look out over the square where guests can order from a small menu while downing gin & tonics. In the summer, live jazz sweeps over the proceedings on Thursday nights. What a great location! There’s nothing quite like being across from the Cathedral, but it’s also the gateway to the winding alleyways of the Gothic Quarter. If you cross the street going east, you’re in the Born neighborhood with dozens of excellent bars, restaurants, and shops. Just minutes from the hotel is a metro stop and taxis are always cruising up and down Via Laietana next to the hotel. One thing to note, because the Cathedral is a main tourist draw, it’s also a favorite for pickpockets. Just mind your surroundings at all times. Just up the street inside Hotel Ohla is Caelis (4-minute walk) a one-Michelin-starred delight helmed by famed chef Romain Fornell. For something a little lighter, check out the Santa Catarina Market (3-minute walk) where dozens of food stalls give you the opportunity to sample a variety of Spanish favorites. Head across the street to The Edition hotel, where inside is Cabaret (3-minute walk) a one-of-a-kind dinner theater joint that turns into a late-night club. For a chic and flirty rooftop scene, check out Skybar (3-minute walk) on the roof at Grand Hotel Central. It’s not all about the location across from the Barcelona Cathedral – but let’s be honest – it’s mostly about it. Guests will be wowed each morning as they exit the hotel right in front of the Gothic masterpiece. Beyond the church are the quaint and charming alleyways of the Gothic Quarter, which walking through is the best way to see the ancient parts of the city. Aside from the location, the hotel is a refined spot with a high level of service, spacious and gracious rooms, and an unbeatable rooftop. Though it feels a bit dated at times, you’ll get over it each time you leave the front door to gawk at the Cathedral.